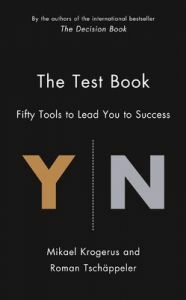 This pocket-sized compendium of the world's fifty most useful tests is a vital tool for anyone looking to gauge their abilities and improve their performance. From intelligence to personality type via creativity and leadership skills, Krogerus and Tschappeler will help you see how you fare on every essential trait you need to succeed. Beyond your own abilities, The Test Book also provides sample diagnostic tests for your career, relationship and business, sketching out not just what your skills are but how well you're utilising them too. Some are old favourites - GMAT, MBTI, IQ, EQ - and many more are little-known tests with genuinely new insights. Every single one has been condensed to just a few pages, leading you to the quickest route to self-knowledge. With in-depth analysis of the history, strengths and weaknesses of each test and what your answers mean for you, The Test Book is the fastest and most entertaining way to equip yourself for happiness and success. Roman Tschappeler is the founder and CEO of guzo, a communication agency based in Biel, Switzerland. Mikael Krogerus is a writer for German and Swiss media. They are the authors of international bestseller The Decision Book  and its follow-ups The Question Book  and The Change Book , which have sold over a million copies worldwide.